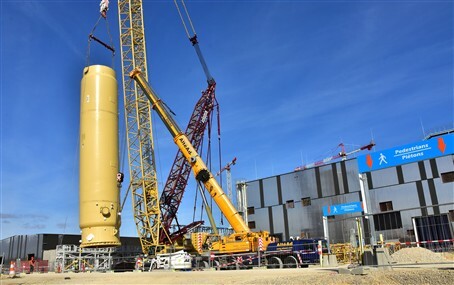 On Wednesday 14 February, the heartbeat of the impressive ITER Cryogenic facility started to beat faster welcoming on its premises the first of the six gaseous helium (GHe) tanks that Europe has been responsible to manufacture. A lifting operation which started early in the morning was successfully concluded when the component, measuring 25 m and weighing 150 t, was placed on a 2.5 m foundation made of concrete and steel. As the workforces were tightening the bolts, and the tank was firmly fixed on the ground, there was a moment of rejoice from all the workforces involved in this task. The hard work of the previous years, from designing this tank to finally transporting it on-site, had paid off. The tank took its final position on the site of the biggest fusion experiment. “This delicate operation required a lot of planning to ensure the lifting of 150 t safely and in a timely manner. It took roughly one week to assemble the different parts of the crane we had to use. Every movement had to be carried out with extreme precision given the load it was lifting” explained Marc Simon, F4E’s Deputy Head of Cryogenics overviewing this technical achievement. The installation of the tank has been the result of the excellent team work between F4E and the ITER Organization, together with a number of F4E industrial partners such as Air Liquide, responsible for the fabrication and installation of the tank; the VFR consortium (Vinci Ferrovial and Razel-Bec) managing the construction of the Tokamak complex and the auxiliary buildings; Technilevage, Altead and IREM- Air Liquide subcontractors- performing this operation. The GHe tanks will recover the helium from the ITER machine and provide a buffer during its operation. Each of them will store roughly 800 kg of helium. As part of ITER’s cryogenic system they will play an important part in the operations required to cool down the machine to -269˚ C and store the gases. In the months to follow, 15 more large lifting operations are planned to be performed at the ITER Cryoplant facility together with the installation of more equipment by Air Liquide, INOX, M+H on behalf of the Omega consortium, Demont, Linde and AS Scientific.